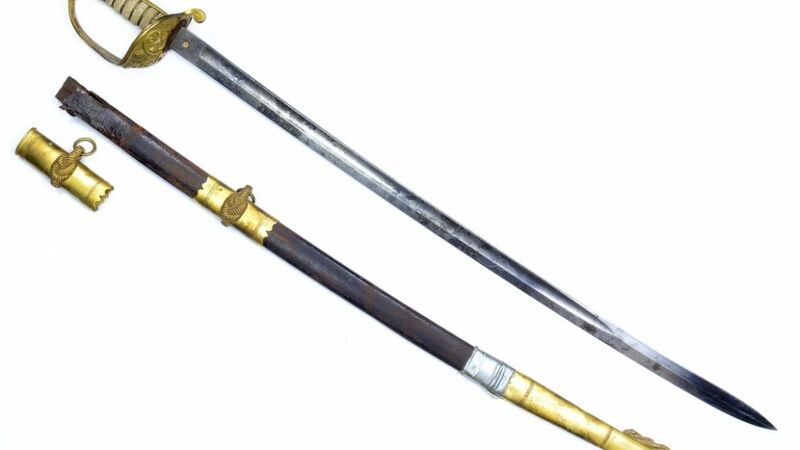 On September 15th, 2016 Farmer Auctions sold a Confederate Naval Officer’s Sword for over $15,000. An employee of the local Goodwill branch brought in the sword after receiving it as a donation in the Rocky Mount Area. The sword, one of about twenty known examples, drew attention from The Roanoke Times and WSLS 10. Although the sword was destined for the American South, its story began across the Atlantic. Birmingham, England-based sword manufacturer Robert Mole & Sons began producing swords for the British government in 1835. Their expertise, and the South’s lack of weapons manufacturing, won Mole the commission to make dress swords for Confederate troops during the American Civil War (1861-1865). These swords were not issued weapons, but were rather purchased by the officers themselves for ceremonial purposes. This sword bears the Mole stamp, a clue of its legitimacy, on its spine near the guard. The left side of the sword is stamped “Courtney & Tennent/ Charleston, SC.” This stamp indicates that—once manufactured—Charleston, importation magnates Courtney & Tennent took responsibility for the sale of the sword. George Tennent purchased a wide variety of items for the Confederate Navy, from cannons to the captain’s china. Because Mole only contracted with a few American import companies, this stamp is another key to the swords authenticity. The Confederate Congress formed the Navy of the Confederate States in 1861 to protect Confederate harbors and coastlines, like those used by Courtney & Tennent in Charleston. However, it is unlikely that the original owner of this sword ever used it to protect or advance anything more than his own reputation as an officer. Elaborate engraving highlights the blade, featuring anchor, flag, and crossed cannon motifs . 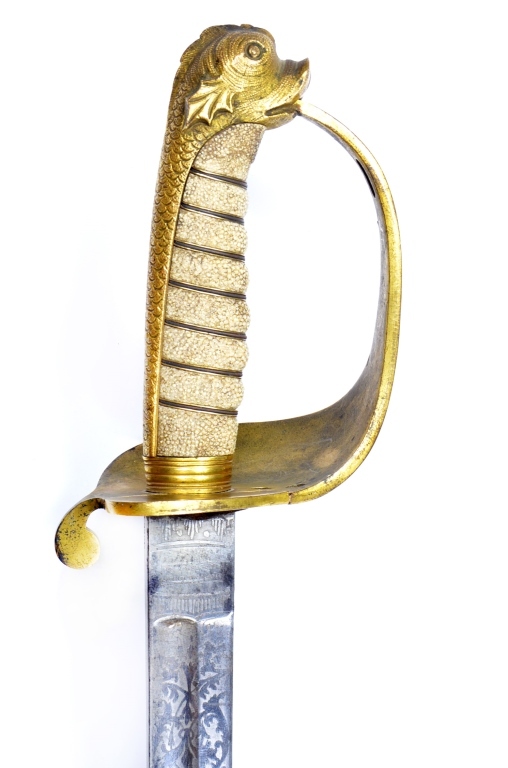 Paired with a detailed gilt pommel in the shape of a dolphin and ray skin grip, the sword’s visual characteristics connect it to its ceremonial function. Pooley Sword, Ltd., “Evolutions of Swords: Swordsmiths in England,” (2016). Matt Chittum, “Rare Confederate naval sword, donated to Goodwill, on the auction block,” The Roanoke Times (September 14, 2016).